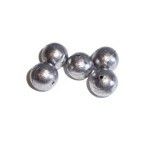 Drilled Bullets are spherical weights with a hole which allows line to be passed through. They have a range of uses in sea angling but are most commonly used by anglers constructing float rigs to catch species such as pollock, wrasse, garfish and mackerel, although they can also be used to add weight to jelly lures. Available in four weights: ½oz, 1oz, 1½oz or 2oz weights. Sold individually. Please note: weights supplied may be slightly oval shape, rather than the spherical shape pictured.